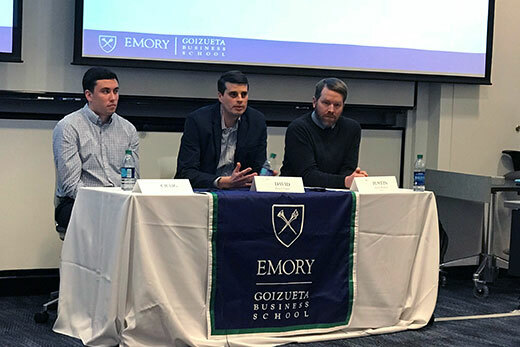 Associate Professor of Marketing Mike Lewis brought in representatives from the Atlanta Falcons, Braves and Hawks to speak with his students and collect data for his new research instrument, "The Atlanta Sports Survey." One project students will focus on this spring in Associate Professor of Marketing Mike Lewis’s Sports Marketing Analytics class is creating a marketing research instrument called, “The Atlanta Sports Survey.” After the survey is created, the students will then analyze the data. To help provide better insight for the survey, representatives from the Atlanta Falcons, Braves and Hawks visited the class to speak with the students. Last year, students did a similar survey which was emailed out to fans of the Atlanta Braves, Hawks, United and Falcons. The plan is to email out this year’s survey to Atlanta sports fans again. The survey will focus on fan preferences and behaviors across customer segments. In this project, students will look at customer experience and the purchase funnel.